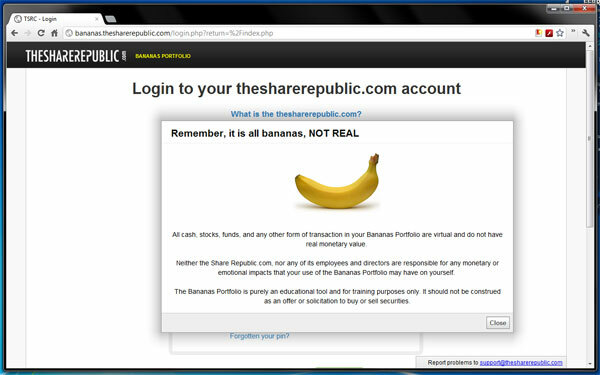 The Share Republic.com launches its share trading education tool, Bananas Portfolio. It is a virtual share trading platform designed to emulate real trading scenarios, where users can learn how to invest in real companies quoted on the stock markets without risking a single penny. Too bad if they make a handsome profit though, that has no real monetary value either. Users log in online and create their unique password. They deposit virtual money using the debit card deposit screen, and then they are ready to buy and subsequently sell shares. Users can then monitor their newly created portfolio(s) every day, and have two pie charts of their investments grouped by cash value and industry sectors. Contract notes and transaction history are all available, as if for real. Company share prices are real London Stock Exchange market prices with 15 minutes delay. This is a unique educational tool which allows so many features for the users free of charge. View a five minute demo on YouTube or test it yourself. It only takes a few minutes to open an account.